What is it about pizza that makes it so popular and almost completely irresistible? Is it the cheese? The sauces or toppings? The fun way to eat it? Nobody knows for sure. That’s why we decided to create a pizza that was the highest quality on all levels. Leave nothing to chance. We hunted down the best ingredients and even had to invent an oven to cook them, but we got it right. Grande Mozzarella and other cheeses – Grande says their products are like no other in the marketplace – domestic or imported. It’s true. The company has built its place in the market with an uncompromised dedication to excellence in every ingredient and process. They make cheeses today with the same attention to detail that artisan cheese makers used in Italy at the turn of the 20th century. Every professional Italian eatery knows Grande Cheese as the premier Italian cheese. Burke Meats – Burke has been making pizza meats for decades, and it’s worth the extra effort to get. The quality of Burke Meats is unchallenged by any other source we know. Fine Grind Pizza Flour – Pizza flour requires a very fine grind to make the best pizza crust. The grind we use resembles baby powder. This quality flour requires less water than others and the resulting dough is easier to stretch. It also has a high level of protein at 12.5 percent, which makes the formation of bubbles in the dough larger and stronger than lower concentrations of protein. It gives the crust its airy and crackly consistency that everyone loves. Signature Marinara Sauce – We use a secret combination of tomatoes to create a nuanced marinara sauce that retains its Italian character. We strive for authenticity in every aspect of our pizza and our sauce is a deeply held source of pride. 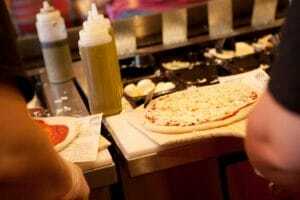 Pizza looks deceptively simple to make, but the details of quality ingredients is only the first step. The most important part is to bring everything together in the right way at the right time. Fork Style Mixer – The preferred mixer for Neapolitan pizza makers for many decades, it simulates the action of human hands necessary for proper leavening without artificially warming the dough. These mixers are exceptionally expensive, but their capacity to improve oxygenation of the dough and to produce consistency across the entire batch was our top priority. Dough Proofing Process – We’re the only pizzeria that uses a two-step, two-day proofing process for our dough, which makes it rise better and makes our crust more airy than the others. Dough is like a foam that has to be allowed enough time for the air bubbles to form before being cooked. Otherwise the crust comes out flat, hard and flavorless. Authentic Neapolitan Oven – An authentic Neapolitan pizza has a short cook time in a very hot oven. 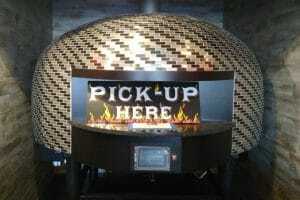 Our custom-made, 7,000-pound oven has a rotating platform to ensure our pizza cooks to perfection in only two minutes. The pizza is hot and perfectly cooked every time! We have a passion for pizza, because it’s part of our lifestyle. Pizza has been a part of our culture since childhood. Sure, we’ve been accused of being obsessed with perfection, but who would you rather make your pizza? Take one bite, and all the attention to detail will suddenly make sense.